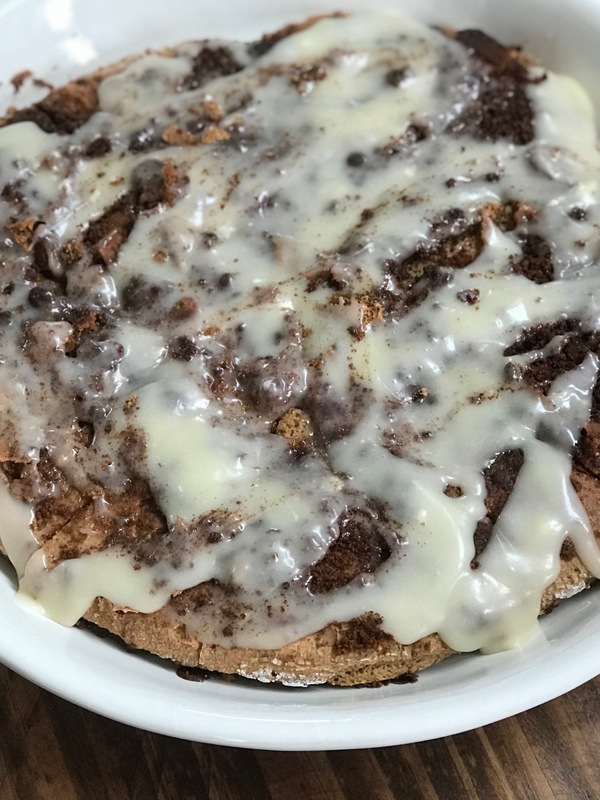 Cinnamon Roll Dessert Pizza is a grain, gluten and yeast free crust topped with a buttery, cinnamon sugar streusel and drizzled with cream cheese frosting! Yes, I’m a fitness & nutrition coach, but I also believe in eating a balanced diet that includes sweets (and beer). If you can’t treat yourself (and enjoy it) then what the heck are you even doing? No one food is going to make or break your diet and goals, it’s truly just about finding balance in everything! 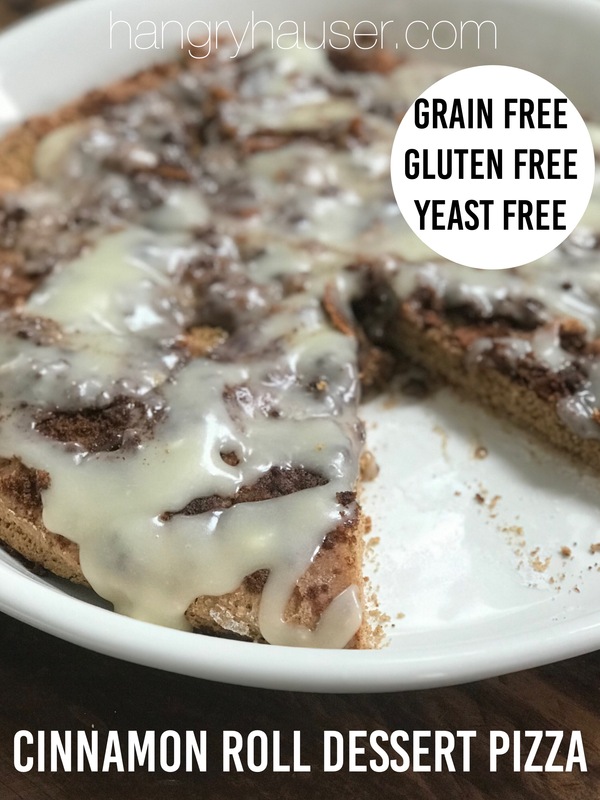 This dessert pizza is delicious and I would never want to skip out on it. 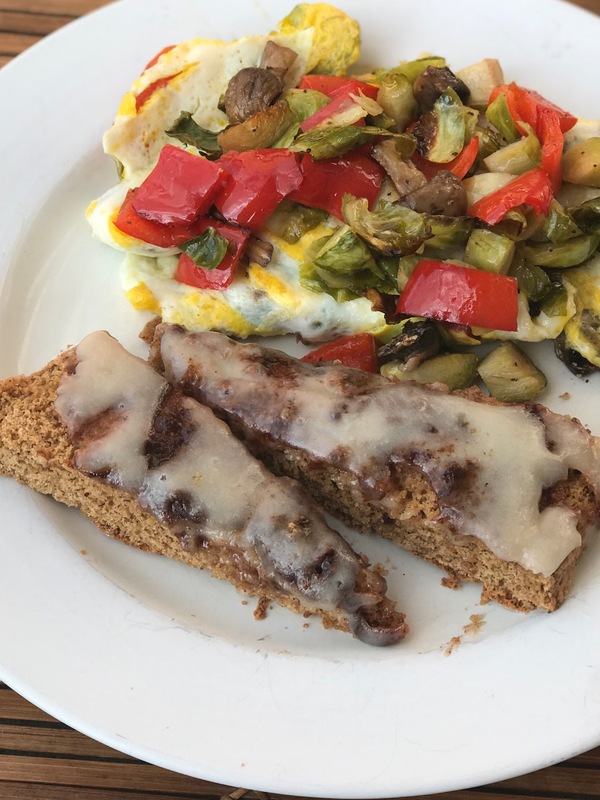 Served up with a veggie filled omelet and I had myself a very balanced meal! Another way to practice moderation is to only make things like this when you have company. 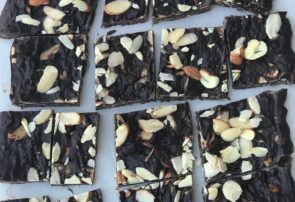 You’ll have no option but to share and there won’t be any leftovers for you to be tempted to over eat! 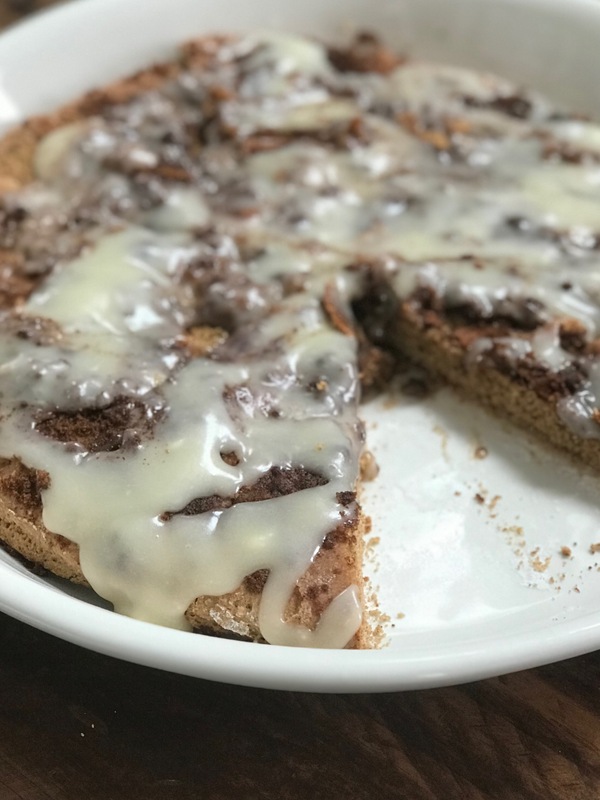 For this cinnamon roll inspired pizza, I topped with butter, a cinnamon/coconut sugar mixture and then a heavy coating of cream cheese frosting! We start by creating our pizza dough. I used my regular pizza crust as a guideline, but modified it to work with the cinnamon roll theme. 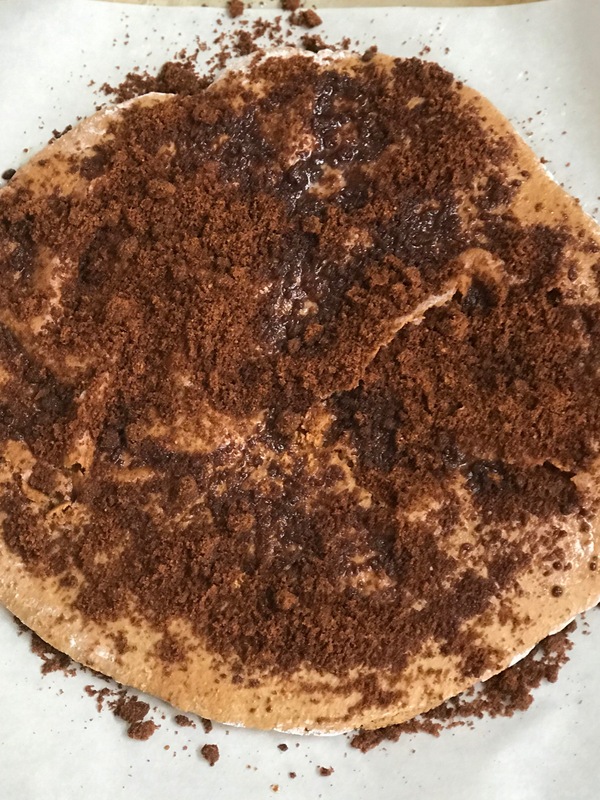 In a large mixing bowl, whisk together 1 1/4 cups tapioca flour, almond flour, baking powder, coconut sugar and cinnamon. Next, add in eggs and combine using a wooden spoon. Mixture will start to come together, but will be very crumbly. Add in milk and continue to combine with a wooden spoon. Mixture will form together and will be very sticky. Add in 1/4 cup more tapioca flour and knead dough with hands until it is no longer sticky and easy to work with. 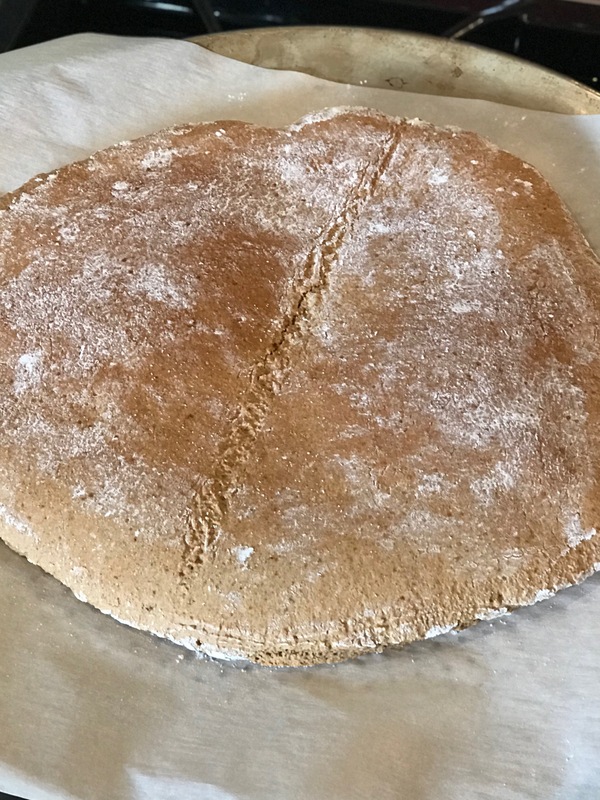 Cover countertop in more tapioca flour and place dough on countertop to roll into a 10×10 inch pizza crust. Lightly coat the top of the crust in tapioca flour, fold in half and transfer to a parchment paper lined pizza baking sheet. I recommend a pizza pan with holes in it, like this one. Unfold crust on pan and bake for 15 minutes at 375 degrees. While crust is baking, prepare Cinnamon Streusel Topping. In one bowl, melt butter. 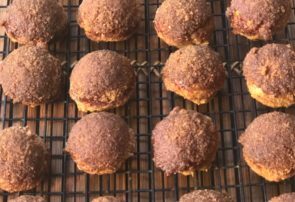 In another bowl, combine coconut sugar and cinnamon. Coat the top of the crust in melted butter and then sprinkle cinnamon/sugar mixture evenly over crust. Place crust back in oven and cook for 5 more minutes at 375 degrees. While crust is baking, make Cream Cheese Frosting by blending cream cheese, butter, vanilla extract, powdered sugar and milk. 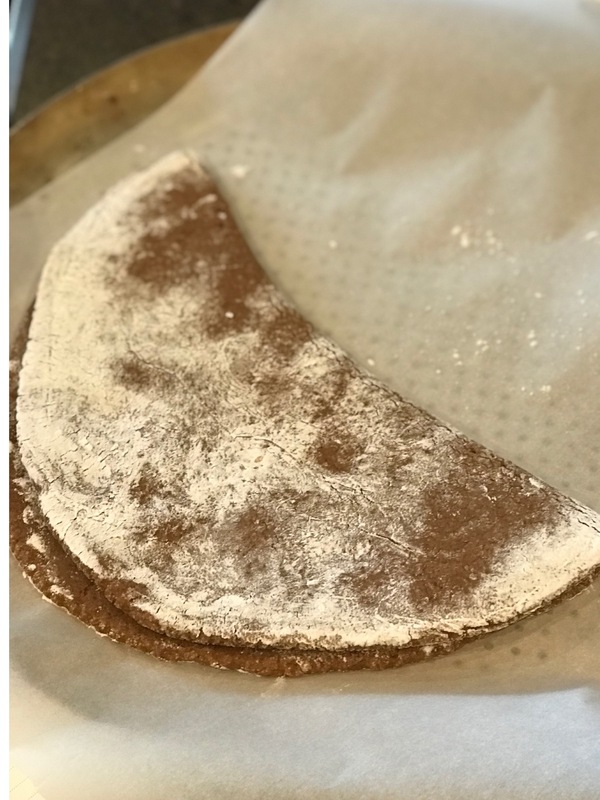 Remove pizza crust from oven and slice into 8 big slices or 16 smaller slices (I recommend 16 because a little bit goes a long way with this). Drizzle cream cheese frosting over pizza and serve warm! 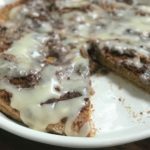 This dessert pizza is best served warm, straight from the oven! 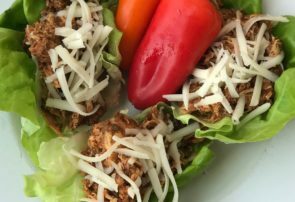 If eating leftovers, I recommend reheating first! For a balanced breakfast or brunch, I recommend serving with my egg casserole, which is also a great dish to feed a crowd. 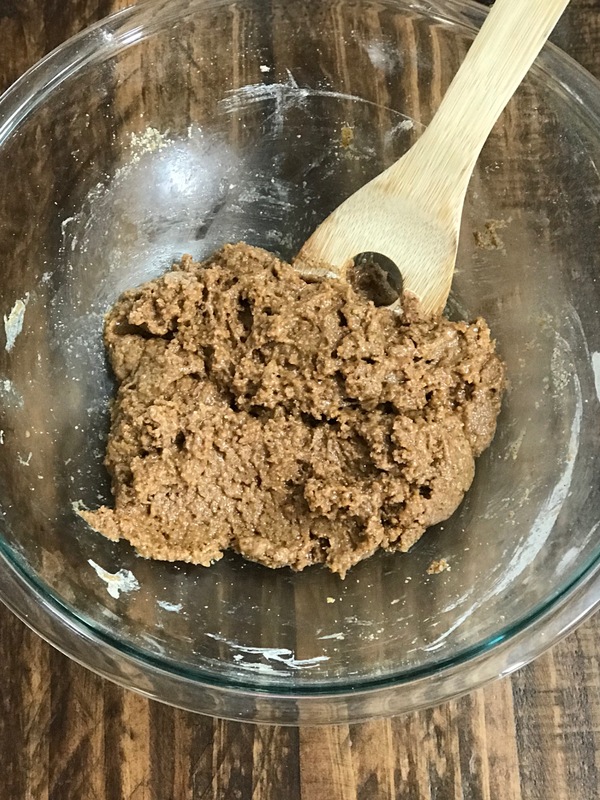 In a large mixing bowl, whisk together 1 1/4 cups tapioca flour, almond flour, coconut sugar, cinnamon and baking powder. Add in eggs and combine with a wooden spoon till mixture looks very crumbly. Next, add in milk and continue mixing with a wooden spoon till mixture forms into a ball and is very sticky. 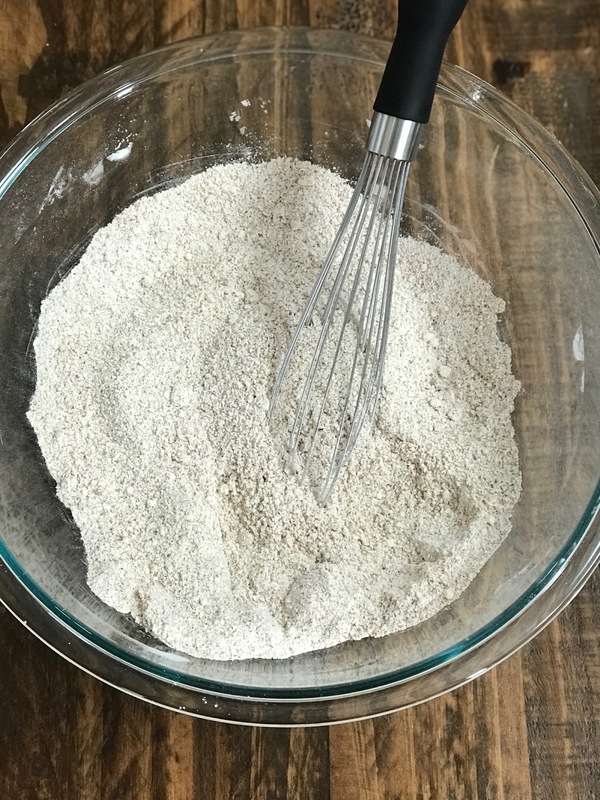 Add in remaining 1/4 cup tapioca flour and knead dough with hands until dough is soft and easy to work with. 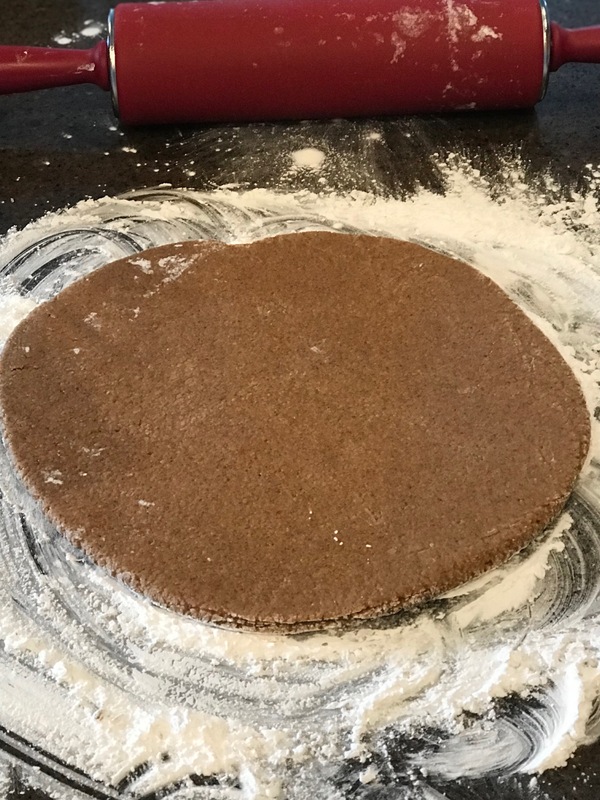 Cover countertop with tapioca flour and roll dough out to a 10x10 inch pizza crust. Sprinkle tapioca flour on top of dough, fold dough in half and transfer to a parchment paper lined pizza sheet. Unfold pizza onto sheet. Bake crust at 375 degrees for 15 minutes. 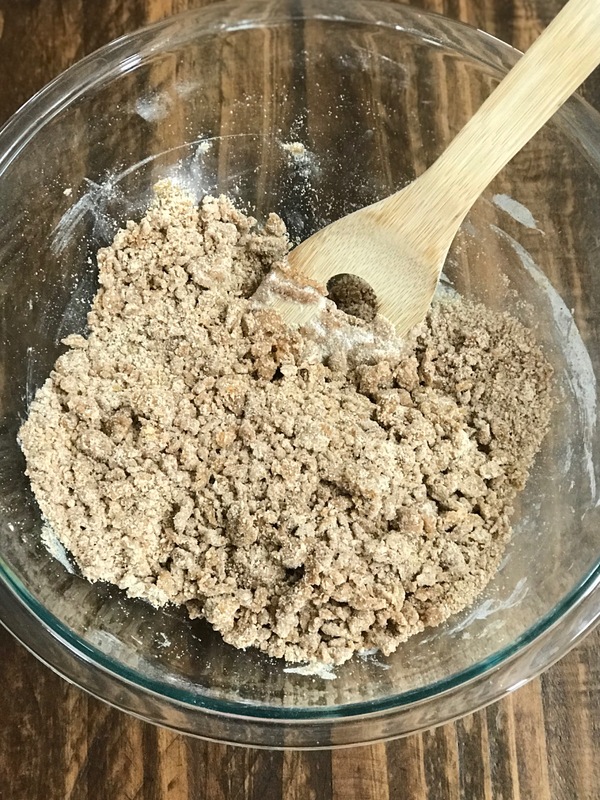 While crust is baking, prepare cinnamon streusel by melting butter in a small dish and combining coconut sugar and cinnamon in another dish. When crust is done, remove from oven and spread butter over crust then sprinkle cinnamon/sugar mixture evenly on top of butter. Put crust back in the oven and bake for 5 more minutes at 375 minutes. 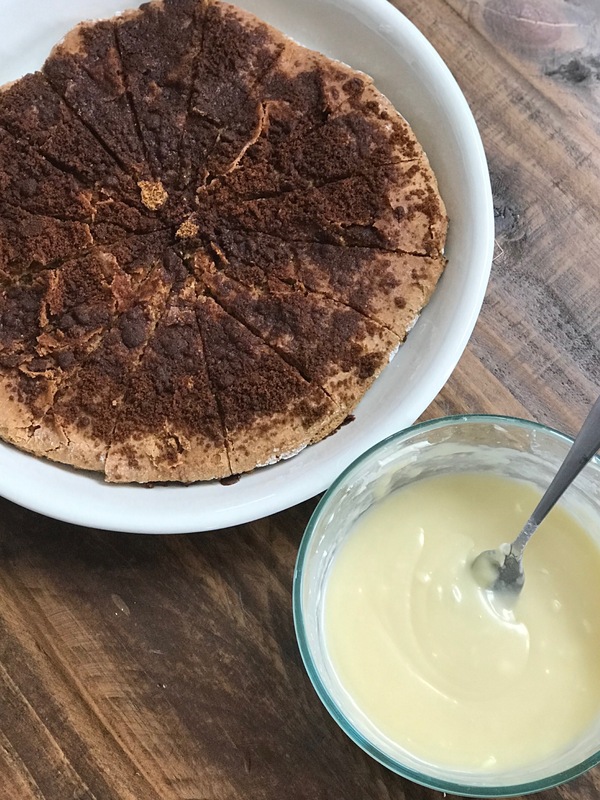 While crust is baking, prepare Cream Cheese Frosting by blending cream cheese, butter, vanilla extract, powdered sugar and milk in a medium mixing bowl. When crust is done, remove from oven and slice, using a pizza cutter, into 8 big slices or 16 smaller slices. Pour cream cheese frosting over streusel and serve warm.